Probably the biggest impact of emigrating will be losing your UK residence status as this can have a huge effect on the amount of income tax and capital gains tax you pay. We list the steps you need to take to convince the taxman that you are non-resident and discuss some of the traps the authorities have set to catch 'phoney emigrants'. The first few chapters look at the different rules in establishing non residence before April 2013 and after this date. UK emigration can lead to a lot of UK tax planning opportunities. We therefore look at the specific tax implications of UK emigration in detail. 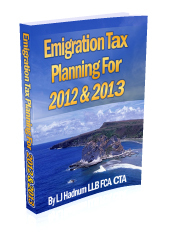 The Author of "Emigration Tax Planning For 2012 & 2013" is our site Editor, Lee Hadnum. Lee is a rarity among tax advisers having both legal and chartered accountant qualifications. After qualifying a prize winner in the Institute of Chartered Accountants exams, he also went on to become a chartered tax adviser (CTA). He worked in Ernst & Youngs Entrepreneurial Services department for a number of years before setting up his own tax planning practice. He is now a full time tax author.